Knives have been used as weapons, tools, and eating utensils since prehistoric times. However, it is only in fairly recent times that knives have been designed specifically for table use. Knives have been used as weapons, tools and eating utensils since prehistoric times. However, it is only in fairly recent times that knives have been designed specifically for table use. Hosts did not provide Cutlery for their guests in the Middle Ages in Europe. Most people carried their own knives in sheaths attached to their belts. These knives were narrow and their sharply pointed ends were used to spear food to raise it to their mouth to eat. 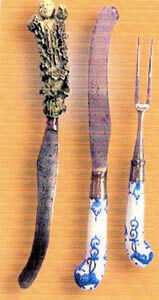 Long after knives were adopted for table use, however, they continued to be used as weapons. Thus, the multi-purpose nature of the knife continued to pose the threat of danger at the dinner table. However, once forks started to gain acceptance as a more efficient way to pick up food, there was no longer any need for the dangerous pointed tip of the 'dinner knife'. In 1669 King Louis XIV of France decreed all pointed knives on the street or used at the dinner table 'illegal' and he ordered all knife points ground down, like those similarly used today...in order to reduce violence! Other design changes took place following the grinding down of the knife point...cutlers began to make the blunt ends wider and rounder to make for ease of use, in combination with the early 'two pronged' fork. Many knives were designed with handles rather like 'pistol' grips and a blade which curved backwards so that the wrist would not have to be contorted to get food to the mouth! The birth of the 'blunt-ended' knife in Europe had a lasting effect on American dining etiquette. At the beginning of the 18th Century, relatively few forks were imported to America. However, Knives were still being imported with the ends becoming increasingly blunter. Due to the Americans having very few forks to dine with and no pointed-tipped knives, they were forced to use spoons in lieu of forks. Using the spoon to steady the food whilst cutting, then switching the spoon to the other hand in order to scoop up and eat. The use of Knives as weapons and tools dates back to Prehistoric Times. 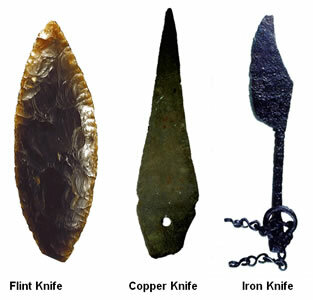 The earliest Knives were made of Flint. The first Metal Knives were symmetrical double edged daggers, made from Copper...the first single eged knife was made in the Bronze Age 4000 years ago. These Knives would have been used for hunting, cooking and Carpentry. 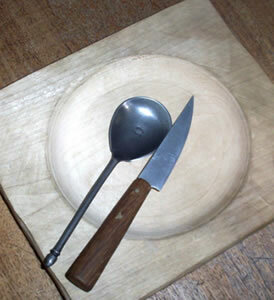 Knives were first used as Cutlery 500 years ago...here is an example of a Tudor Diner Set. Before that people would carry their own Knife in a Sheath attached to their belt. These Knives were narrow and their sharply pointed ends were used to spear the food rather than using a fork, as we do today. Various types of Eating Utensils. There are endless type of knives that have been designed by man over the years...with many different purposes. It is important to remember that any 'knife'...is capable of inflicting serious or fatal injuries! The most wonderful use of a knife invented to actively save life, is the 'Surgical Knife'...a marvellous invention used by skilled hands for good by Surgeons as well as Vetinary Surgeons! How many uses for the good of 'Man' can you think of...?